If you share your Mac on a network you may be interested to know who is connected to the Mac at any given time. This may include listing currently logged in users through a variety of network protocols, even locally, or perhaps just a history of users logins over a period of time. While Mac OS X Client doesn’t offer the same level of information as Mac OS X Server, you can still find user connection details by using a variety of tools built into all versions of Mac OS X.
We’ll cover finding active user accounts through Activity Monitor, the ‘last’ command, and the ‘who’ command. This is fairly comprehensive, meaning it will include all users who are currently connected and/or actively logged onto a Mac, whether by another user account in the background, a Guest user account, general sharing from public folder access, a user connected through a local network share for the purpose of sharing files with another Mac, network users connected from Windows PC’s or linux machines through SMB, remote logins through SSH and SFTP, just about everything. If you’re looking for a specific user account, you can easily find that user as well as all the processes they are running, be it apps, services, or nothing, and what kind of resources they are using. Choosing the “Network” tab within Activity Monitor will offer details about user network usage as well, helping to indicate if they are copying or receiving files from the Mac to their own. To properly make use of this information, you’ll want some basic understanding of what user accounts exist on the Mac (i.e. who is found in the /Users/ folder), but also understand the root / superuser account, in addition to services and daemon agents running in the background on all Macs, which may show up in the Users list with names like spotlight, netbios, usbmuxd, locationd, coreaudiod, window server, mdnsresponder, networkd, appleevents, amongst many others. Ultimately, the ‘last’ command may prove more useful for those comfortable with the command line. 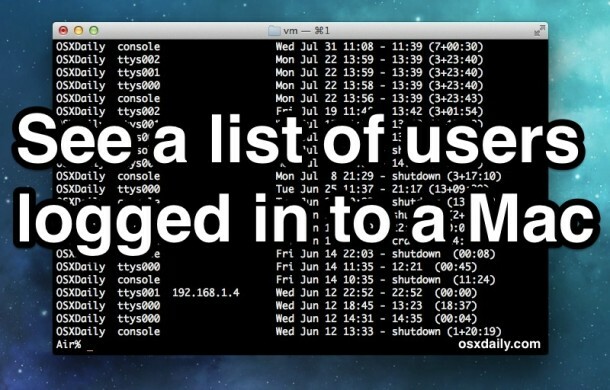 The command line tool ‘last’ offers a simple way to see a history of what users have logged into a given Mac, both locally and also through a network connection like AFP, the default sharing protocol for Macs. Using ‘last’ is simple enough, but you should have some familiarity with the command line to get the most use out of the utility and to comprehend the output. This is case sensitive, so the user ‘osxdaily’ would be unidentified while “OSXDaily” will return positive results, thus be sure to use proper casing. If no IP or network origin is shown, this indicates the user is logged in directly on the Mac, either through the standard Mac OS X login process, Fast User Switching, su / sudo, or something similar. Users who are actively logged in, whether through a remote connection or the local machine, will show “still logged in” as their status. 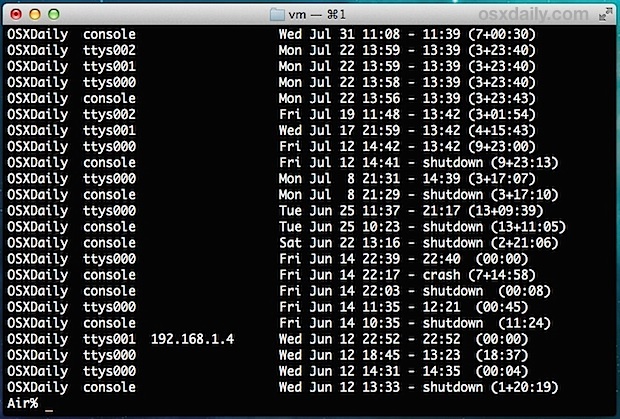 A potential hiccup for the ‘last’ command appears when you have users logged in through the SMB / Windows protocol, which is optionally enabled within Mac OS X to allow file sharing between a Windows PC and Macs, and users logged in to the Mac through SMB will not show always how up through the ‘last’ command output. This leaves a few other options, like using ‘netstat’ or, perhaps easier for most users, browsing in Network Activity from the Activity Monitor as was outlined at the beginning of this article. 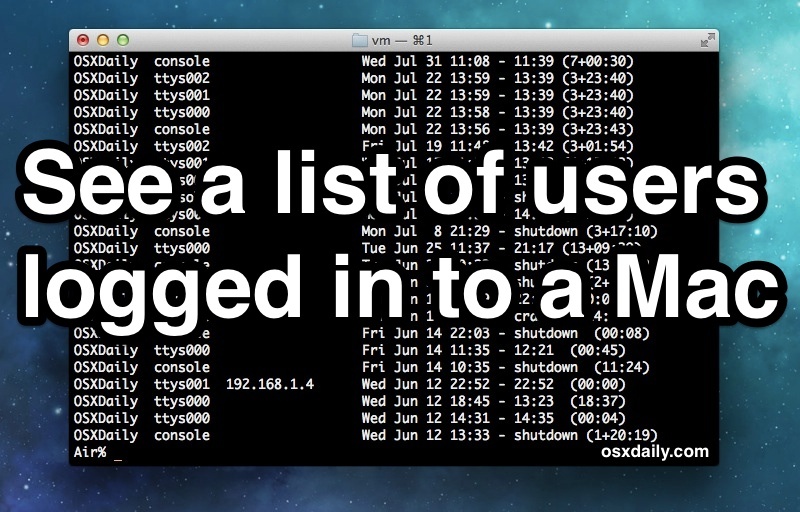 This shows all instances of your own user account, as well as logged in users through a connection exterior to the Mac. Know of another way to see what users are currently logged into a Mac? Share it with us in the comments! Very thorough as usual, love the info thanks guys! Now, I wish you could just see a simple list of “Connected Users” in the “Sharing” control panel, is that so hard to ask of Apple? To include AFP, you can add it’s ports to the awk regex. wow… pretty nice tips! THX! “w” command is already more powerful than “who” ! I’m going to take a look at the man page ! Thanks for the tips ! +1 Septillion for w. who on mac is lacking horribly, but w has the details you need. When I did the “w” it came back with this: does this mean someone other than myself is logged in? we are using MAC staitons in our network. there is station on which user will copy data. there are 15 users who need to copy data from this station. but currently we can only connect 5-6 user at a time. kindly guide me, how to connect 15 users at a time to MAC station. Is there a way to delete the list of logged in users from the “last” command? This worries me. How do I go about disconnecting the established connection? HELP!